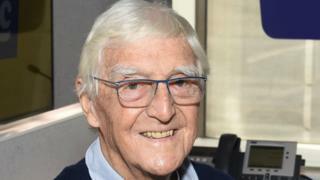 Chat show host Sir Michael Parkinson has admitted he now questions some of his behaviour towards women years ago. Speaking to GQ magazine, Sir Michael said: “Men are in a quandary. If I was doing what I did then, I would have to watch myself. I could get arrested. The 82-year-old described himself as having been “an outrageous flirt”. Sir Michael, who has never been accused of any wrongdoing, was asked how he would feel interviewing Harvey Weinstein. “You would have to stop yourself from punching him first,” he said. He also said he regretted not tackling a man over an incident involving his wife. “I regret not doing something to an editor – who shall remain nameless, for now – who exposed himself to my wife, at my house, no less,” he told GQ. Sir Michael’s television career spanned 50 years and saw him interview high-profile guests such as Orson Welles and Sir Elton John. He announced his retirement in 2007.